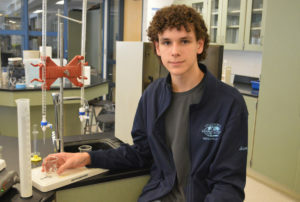 Sam Koblensky ’19 placed second in the Local Chemistry Olympiad earlier this month at Siena College, which qualifies him for the National Chemistry Olympiad. The field included students from Shenendehowa, Niskayuna, Queensbury, Albany and Albany Academy high schools. Mr. Koblensky is building an impressive resume that includes state championships in two different events – Chemistry Lab and Hovercraft – at the 2018 NYS Science Olympiad. He will compete in the National Science Olympiad tournament with his team at Colorado State University in May.